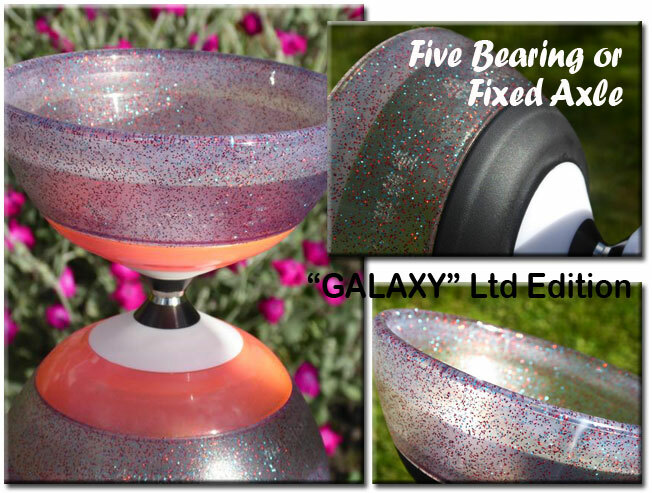 ''Galaxy'' is the 2018 Limited Edition colour from Sundia and features glitter inside the transparent cup material to reflect light and give some sparkle. Very limited numbers of this colourway were produced, and most were reserved for sale in Taiwan so these will be very hard to find outside of Asia. 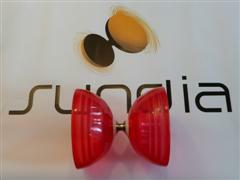 Other than the special colour this is the same spec as the standard G3 Evo diabolo. This is the FIVE bearing version of the Sundia Evo G3 diabolos. It includes the use of Sundia''s patented Stability Rings™ and Hybrid Axle™. The Evo diabolos have fantastic weight distribution which means even though they are lightweight for their size, they have better stability and spin than that of a much heavier diabolo because the weight is in the right places to maximize centrifugal force. The cups on the G3 model are transparent using the same material as the shining diabolos which undergo the same post production ''blasting'' process, giving a lovely textured matt finish making corrections easier and more reliable. The transparent cups look truly awesome with LED lights fitted. The 5x bearing system feels incredibly smooth even by Sundia''s high standards and offers unprecedented spintime and stability, especially with vertical play, as it has been designed to minimize friction when tilted to any angle. The 5 Bearing version comes with the pink bearing style rings fitted. Note - the pink rings have been found to fade colour with exposure to sunlight going from bright pink when new, to pale pink over time. If you would prefer to receive this item with black bearing rings fitted (which don''t fade) instead of pink please select it below. Ability - All levels - Due to the low weight and high stability this diabolo really is perfect for beginners & kids right through to professional performers. Note - sold without handsticks.